Fig. 1: Crystal structure and successfully grown single crystals of BiTeCl. A new compound developed at Tokyo Tech shows highly unusual conducting properties that could be used in future electronic components. Ordinary insulating solids, such as diamond, have energy bands that are fully occupied by electrons. The conducting band is so far away from the valence band in diamond that electrons do not have sufficient energy to move - the 'band gap' is large - therefore no electric current can be carried. In recent years, researchers have become interested in materials called topological insulators (TIs), which act as insulators on the inside, but are highly conductive on their surfaces. In TIs, an exceptionally strong spin-orbit interaction inverts the energy gap between occupied and empty states, so that electrons at the surface can flow across the gap. These properties are intrinsic to the material, meaning a TI remains conductive even if its surface is not perfect. 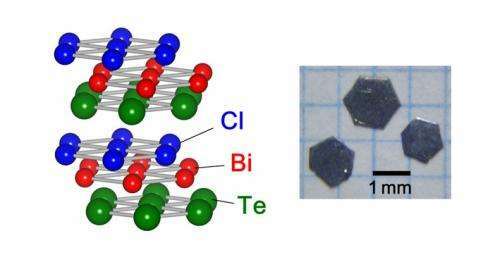 Now, an international team of scientists from Japan, the UK and the USA, led by Takao Sasagawa at Tokyo Institute of Technology, have successfully developed a new TI from bismuth, tellurium and chlorine (BiTeCl). Their new TI is inversion asymmetric, meaning it has different electronic states, and therefore different polarities, on each crystal surface. As a result, it exhibits many topological effects that have not been seen experimentally before. "The metallic surface state of a TI is similar to graphene in that the electron mobility is remarkably high due to zero-mass electrons, or Dirac fermions," explains Sasagawa. " The Dirac fermions have a characteristic spin and in this context they can host a wide range of exotic quantum phenomena. Symmetry-breaking is the best way of inducing these fascinating topological effects." Fig. 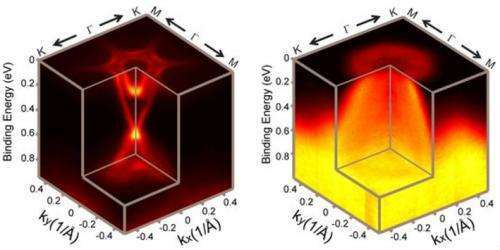 2: Electronic structures of BiTeCl's top and bottom crystal surfaces observed by photoemission spectroscopy. Sasagawa and his team optimised their laboratory growing conditions to produce single crystals of BiTeCl. They then split each single crystal to obtain two different surfaces - one Te and one Cl - and observed their electronic structures using spectroscopy. The composition of the TI's top and bottom crystal surfaces are such that their charge carriers are opposite, leading to polarization. The TI can therefore be used as a diode, allowing current flow in only one direction. It also exhibits pyroelectric capabilities, meaning that it can generate a temporary voltage when heated or cooled. BiTeCl shows promise as a platform for other topological phenomena, and may have applications at high temperatures. The discovery could also have significant implications for the development of quantum-based technologies in future, as Sasagawa explains: " We would like to discover a topological superconductor whose surface can host Majorana fermions - particles which are their own antiparticles, and could be used for the development of topological quantum computing."